Little update. So the brakes I'm doing for the front of my 1303 are the following: I'm using Porsche 944 spindles with a "flip-it kit" to relocate the direction of the tie rod ends. Due to this, I'm also using Kerscher ball joints. For the actual brakes, I'm using 944 rotors that have had the DIAMETER reduced by 1 inch (25mm). This allows a typical Porsche 914 caliper to bolt onto the 944 spindle and have enough swing clearance for the rotor to fit inside. The rotors diameter PERFECTLY places the 914 (D30) pad on the rotor. Now, obviously, 914 calipers are made for 11mm wide solid rotors and the 944 vented rotor is 20mm wide. This is corrected by salvaging the spacers from a set of Porsche REAR M calipers. The Porsche rear M calipers is the SAME casting as the 914 EARLY front calipers, so if you can find a set of the rear calipers in good condition, all of the hardware can be used (bolts, spacers, pad hangers). This is important because both the 914 caliper and the rear M caliper use non-standardized M7 bolts, the M calipers bolts being the infamous Ribe bolts (pronounced ree-bee) which have been out of production for about 40 years, and cost roughly their weight in gold, assuming you can find them. That said, the longer bolts are required to compensate for the width of the spacer, however, one could use the longer of the two original 914 caliper bolts as the shorter bolt once the spacers are in place, and just get longer bolts for the other spot. In my case, the rear M calipers I purchased had three of the Ribe bolts ruined due to some previous owner attempting to use the wrong tool to remove them. A Torx head of the correct size can be used to remove them, however, torquing them, it's suggested by "those who know" to use the correct Ribe bit. Both Lanner Khan (aka Flat) and my machinist friend (who turned down the rotors) thought me silly for what *I* did, which was purchase the correct length M7 socket head bolts from a company called Tola-tool in Germany(Tola-tool was the ONLY company I could find who offered both the correct length AND hardness (12.9) for brake caliper use.). Both suggested re-drilling the holes in the calipers to M8 (a standardized size that is FAR easier to obtain) in the case of Lanner or 5/16th inch (also standardized) in the case of my machinist friend. The reason this was silly was the fact the shipping from Germany to California was almost exactly TWICE the cost of the bolts themselves...which weren't cheap. I elected to not re-drill the calipers out of fear there simply wasn't enough material in the calipers to do this. In the end, I'm happy with the bolts. Cry once, as they say. So, the results of my mods made for a very slick setup that seemed almost meant to be. The caliper is centered over the rotor perfectly with the use of a 2mm shim placed between the caliper mounting ears and the spindle. However, as I was fitting everything together I discovered my first (and really only) major hurdle. The outside of the caliper body hits the HUB edge when everything is bolted on place. I had been fitting everything up with a pair of junk split 914 calipers with the pistons removed to make trial fitting easier. I tried to clearance the calipers a bit but discovered there simply isn't enough material on the body where the piston lives to take material away. Fortunately, I know Flat. Lanner has had a set of 944 hubs on his bus for years that he has turned down by 8mm in overall diameter. I know from my caliper clearancing effort, I only need to remove approximately 2.5mm for the caliper to clear the hub, so 4mm is more than enough for good clearance, thus I'm sending them up to Lanner to have him turn them for me. Quite honestly, I've thought of going with something easier to put together several times, but I've spent too much on those damn calipers (the German bolts AND the sacrificial Porsche rear M calipers) to abandon them. Sadly, I sent out on this path simply because I wanted vented rotors on the front, to match my vented rotors on the rear (straight 944 rear brakes). CSP offers a kit that give 20mm wide rotors with a 42mm piston caliper. These bolt to any typical caliper adapter made for a 1303 without disc brakes (or the ever rare disc brake spindles), thus they have 2.25 inch bolt spacing. Unfortunately there is no way for me to get these for less than a LOT of money. CIP1 is the importer for CSP products in the States. They will special order the kit for me for $1300. Now, that's for JUST two rotors and two calipers, not including shipping. WAY more than I'd like to spend. The other alternative for me, if I must have vented rotors, is having someone like Flat make a set of caliper adapters that bolt to 1303 spindles and having the 944 hubs modded to fit the 1303 spindle. That all said, I think the turning down of the 944 hubs will yield the results I seek. Pictures of the finished brakes, will, of course, follow. 1. 944NA brakes (54mm and 36mm slave cylinders) with 19.05mm pump. Resulting ratio is 2.25. So huge front bias. Same result if using 23.8mm pump or stepped 23.8/19.05mm pump (explanation why stepped pump is not affecting bias is here: https://www.germanlook.net/forums/showthread.php?t=2183). The stepped pump just increases the volume of brake fluid going to the front slave cylinders and makes the pedal harder. This explains what I saw during "MOT", a high efficiency of front brakes (80%) compared to rear (40-50%), this being correlated to front and rear weight. So I do not see any other option except bias bars (or dual pumps) to overcome this issue. Pedal feel is great from my point of view, soft and long travel. I hate hard and short pedal. Ratio is 1.717, so still front biased, but much less. Now, considering the same piston sizes were used in 930 with a 23.8mm pump (no step), and that the 930 is has a closer static/dynamic weight ratio to Bug (both rear engined), compared to 944 (front engined), it seems these brakes will be much better suited for a Bug, ratio-wise not power-wise. I'll try with the stock 19.05 pump first, I have read a lot of positive feedback on this setup. But a question that still remains is why did 944T have a stepped pump with the 4 pot brakes and 930 straight pump, if the step in the pump actually does not affect bias. Just for volume? Did I understand this correctly? 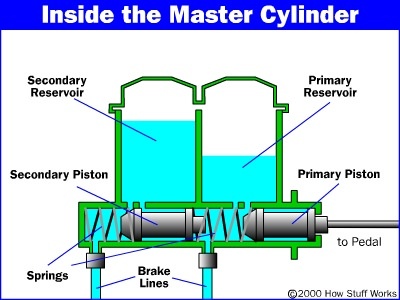 Some older calculations took into consideration for the ratio the master cylinder different steps, but that seems to be false according hydrodynamic laws. That would hold true if the two pistons in the master cylinder would be hard connected to each other, which they are not. Thanks Wally for the confirmation. So it seems that 944T brakes would actually fit better the Bug than the 944NA. I have a curiosity: how do you know which brakes lock up first, front or rear? Do you just feel the car in a specific way? I locked my brakes up a couple of times on hard braking in traffic, but I can not tell which ones did. I just heard the wheels squeak, no deviation from straight line. Can you feel that in specific conditions, on track, for example during hard brake on cornering? I only use my car in normal traffic, which also means some mountain roads, so I did not race it nor do I intend to do so. My "feeling" of the car is that of a normal driver, I have no idea how it is on a track (hm, it was only once at a VW meeting where we had a small autoX track, but that was long time ago and I had no mods). Oh, I really do feel if front or rear locks up first, very clearly. It happens sometimes on an emergency brake situation or if you simulate one. You really should feel it! My advise would be to wait for rain and then just stand on it in different situations and in those street situations/surfaces in the wet, it should still never lock up rears first from a safety standpoint. 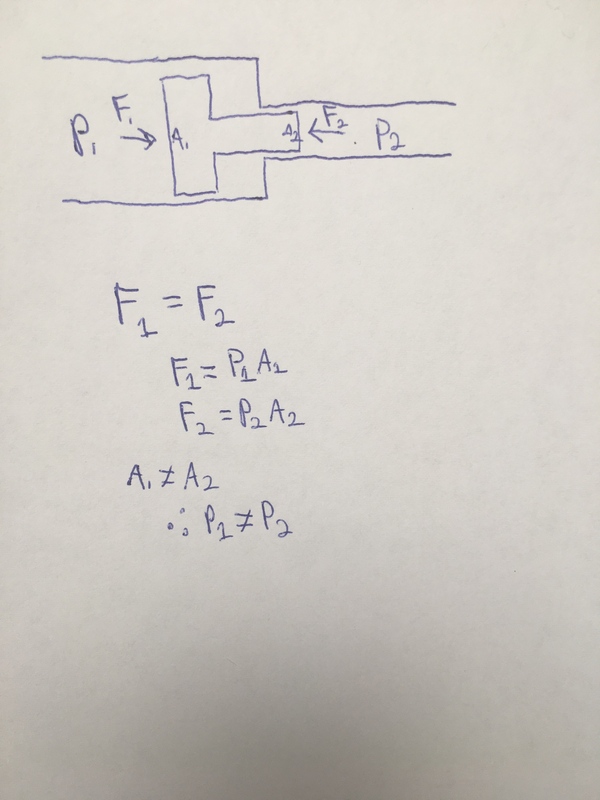 Anyone mind going over the math for why a stepped MC does not effect the preasure output by each cylinder? A dual MC is set up with a floating piston between the two separate cylinders. I'll just leave this here not to confuse people. eskamobob1, I agree partly to your argumentation. But what you have drawn is exactly what it is NOT in the stepped pump (the pistons of different areas are NOT hard linked together). The forces and pressures you computed are correct however if the secondary piston would look like that. But the inside of the pump looks like in the picture from the link https://www.germanlook.net/forums/showthread.php?t=2183. Meaning that the force applied to the second piston is NOT the input pedal force, but it is derived from the pressure of the first: pressure in first chamber (P1) is Fin/d1 (say 400N and 23mm as in the picture), and the force on the second piston is P1*D2 (19mm for second piston). Thus the pressure in the second circuit is the same as in the first circuit.